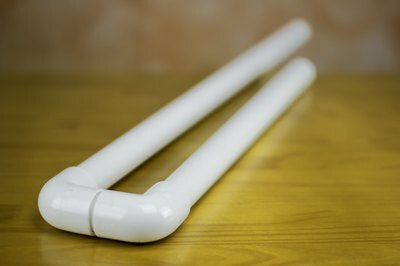 There are lots of musical instruments you can make from PVC pipe, and most of them are wind instruments -- flutes, pan pipes and so on. 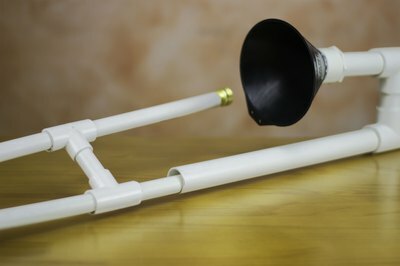 One of the more unique plastic instrument projects is the PVC trombone. 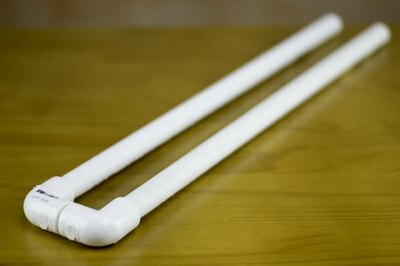 Many designs for PVC trombones require you to build jigs for bending the pipe, but you can avoid all that by using pairs of sweep 90 degree elbows connected by a short length of pipe to make the two U-bends you'll need. With the right parts you'll be annoying your friends and neighbors in no time! 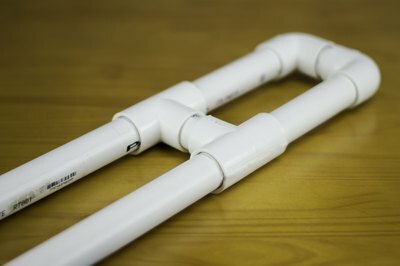 Make a 1-inch U-bend by connecting 2 90-degree sweep elbows with a 1-inch length of PVC pipe. Make sure the open ends of the elbows are aligned and facing the same direction. 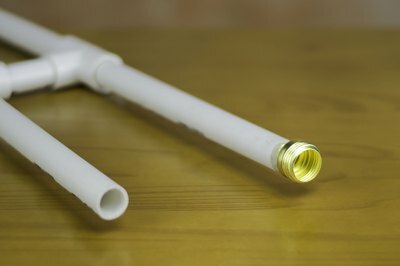 Glue the connecting pipe into the elbows. Repeat this with the two 1/2-inch elbows. You now have two U-bends, one of them 1-inch and one of them 1/2 inch. Glue the two 20-inch lengths of 1/2-inch pipe into both openings of the 1/2-inch U-bend. 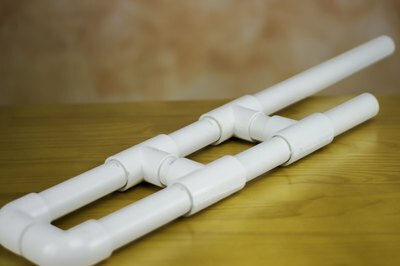 Slide the 2 1/2-inch slip Ts onto the open sides of the 1/2-inch PVC pipes, one on each pipe, so that the slip Ts are about 10 inches from the ends of the pipes, and the stems are facing each other. Glue them into position. 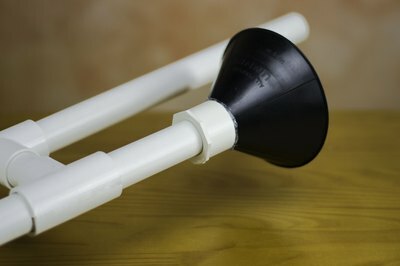 Connect the two stems with a 3-inch length of 1/2-inch PVC pipe, glued into position. This completes the “slide” for the trombone. Glue the 30 inch length of 1-inch pipe into one of the open ends of the 1-inch U bend, and one of the 20-inch lengths of 1-inch pipe into the other end. Slide a 1-inch slip T each onto the 30-inch length and the 20-inch length of 1-inch pipe connected to the U bend. Position them so that the are each about 8 inches from the U bend, with the stems of the Ts facing each other. Connect these stems with a 3-inch length of 1-inch pipe, glued into position. Align one end of the remaining 20-inch length of 1-inch pipe with the open end of the 30-inch length. Slide slip Ts onto each of these pipes, so that they are in alignment and the T on the 30-inch length is about 18 inches from the open end. This should put the T on the 20-inch length about six inches from the end. 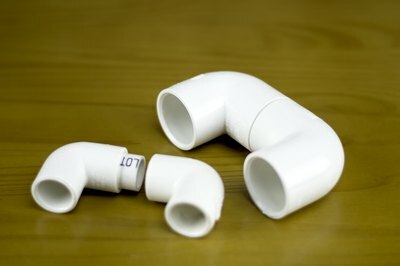 Glue these Ts into position, and connect them with a 3-inch length of 1-inch pipe, glued into position. Glue the 1-inch side of the reducing bell onto the open end of the 20-inch length of 1-inch pipe that is connected to the U bend. This is the bell of your horn. To assemble the trombone, insert one of the open ends of the slide into the pipe with the mouthpiece, and the other end into the 30-inch length of 1-inch pipe. To play this horn, grasp it by the handle close to the mouthpiece and the handle on the slide. Buzz your lips into the mouthpiece. By sliding the slide away from you, you get a lower note, and by sliding it close to you, you get a higher note. The 1/2 inch pipe should just fit into the 1-inch pipe. It should be loose enough to move, but not so loose that air escapes from the connections. If the fit is too tight, try lubricating the 1/2 inch pipe with some mineral oil. If the fit is too loose, try putting a wrap of electrician's tape around the 1/2 inch pipe, close to the open ends. Always use adequate ventilation when using PVC glue. Always test fit your parts before gluing them. 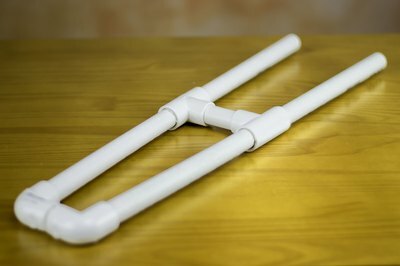 PVC glue hardens very quickly, and it will be very difficult to free glued PVC joints once the glue has set.